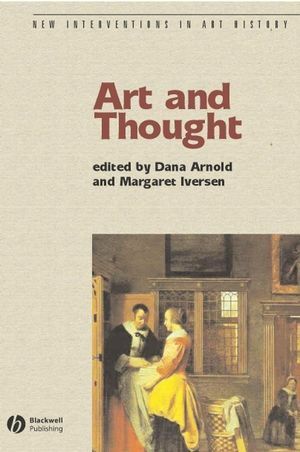 Art and Thought is a collection of newly commissioned essays that explores the relationship between the discipline of art history and important movements in the history of western thought. Brings together newly commissioned essays that explore the relationship between the discipline of art history and movements in the history of western thought. Considers the impact of the writings of key thinkers, including Aristotle, Kant, and Heidegger, on the way in which objects are perceived and understood and histories of art are constructed, deconstructed, and reconfigured according to varying sets of philosophical frameworks. Introduces the reader to the dynamic interface between philosophical reflections and art practices. Part of the New Interventions in Art History series, which is published in conjunction with the Association of Art Historians. Dana Arnold is Professor of Architectural History at the University of Southampton and Director of the Centre for Studies in Architecture and Urbanism. She is series editor of New Interventions in Art History, Blackwell Companions to Art History, and Blackwell Anthologies in Art History. Her recent publications include The Metropolis and its Image (Blackwell, 1999), Re-presenting the Metropolis (2000), Reading Architectural History (2002), and Very Short Introduction to Art History (2003). Margaret Iversen is Professor of Art History and Theory at the University of Essex. She is author of Alois Reigl: Art History and Theory (1993) and Mary Kelly (with Homi Bhabha and Douglass Crimp, 1997). She has published several essays on psychoanalytic art theory, many of which will be collected in the forthcoming volume, Art Beyond the Pleasure Principle. 1. Aristotle, Titian and Tragic Painting (Thomas Puttfarken). 2. Wax, Brick and Bread: Apotheosis of matter and meaning in seventeenth-century philosophy and painting (Jay Bernstein). 3. Kant and Aesthetic Imagination (Michael Podro). 4. Meaning, Identity, Embodiment: The uses of Merleau-Ponty's phenomenology in art history (Amelia Jones). 5. Art Works, Utterances and Things (Alex Potts). 6. Art and the Ethical: Modernism and the problem of minimalism (Jonathan Vickery). 7. How can we think the Feminine, Aesthetically (Griselda Pollock). 8. What was Postminimalism (Stephen Melville). 9. Museum as Work in the Age of Technological Display: Reading Heidegger through Tate Modern (Diarmuid Costello). 10. Thought and Art (Adrian Rifkin).